Figure 13-1 illustrates at a high level the information and content that get synchronized in Filr. The table that follows the figure describes some of the results and implications of the processes that take place. The figure does not illustrate functional details. For example, it does not attempt to show the flow of LDAP metadata and file/folder metadata to Filr services for storage and indexing. Desktop applications for Windows and Macintosh workstations must download local copies of files and folders before accessing them. Before the files and folders in Net Folders (including in Home folders) can be downloaded, their metadata must be synchronized with Filr. 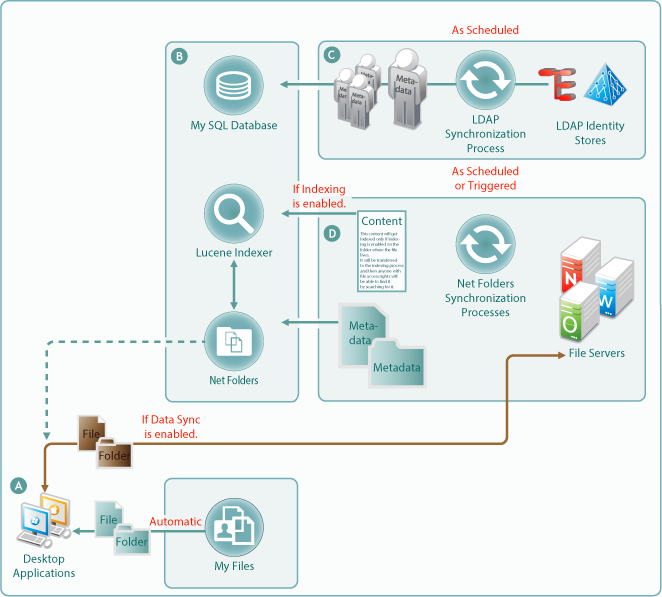 (See the metadata synchronization process indicated in letter D.) For this reason, many Filr administrators perform a manual synchronization when initially setting up a Net Folder so that when users access it from their desktops, they can download the files and folders as expected. Note that the arrow that shows files and folders being synchronized from file servers to desktops, passes through the Net Folders icon. This is because Net Folder files and folders are not stored in Filr. Only their metadata is synced. The files and folders that are synchronized to the desktops come directly from the file servers. Net Folders only facilitate the transfer process. Files and folders in Filr-based personal storage are automatically synchronized to the workstation’s file system. Net Folders are also configured by default to allow data synchronization with desktop applications. After data is synchronized with the desktops, then as long as the desktops are connected with the network, changes to local copies are immediately synchronized with the file server. If the workstation is disconnected, then when the connection is restored, synchronization is automatic. One reason that Filr administrators might disable the download functionality would be to prevent anyone from getting a local copy of sensitive files must be stored only on the organization’s file servers. The MySQL database, the Lucene indexer, and Net Folders work together to provide access to data through Filr. MySQL houses the Filr database. The Lucene indexer indexes all of the LDAP and file storage metadata so that search functionality is available. It also indexes file content for searching in folders that have indexing enabled. And Net Folders provide users who have authenticated with proper credentials, access to files and folders on the network through the file storage metadata that is associated with them. Regular LDAP synchronization is essential to timely user access to their files and folders. Some organizations find it sufficient to synchronize LDAP once a day. Others require more frequent synchronization to keep Filr abreast of changes in their identity stores. Because file and folder activity on network file servers can be in constant flux, and because synchronization needs vary greatly from server to server, Net Folder synchronization is multi-faceted and very flexible. You can set synchronization schedules for each Net Folder Server. The Net Folders associated with that server are then synchronized according to the general nature of the volume or share where they reside. You can also set synchronization schedules for individual Net Folders that will override the server schedules and synchronize the folders either more or less frequently than the server schedule dictates. You can perform manual synchronizations, which is a very useful feature when creating Net Folders to ensure that desktop application users can download local copies for access.